Leading Manufacturer of encapsulated screw compressor, en screw air compressor, screw en air compressor and en series screw compressor from Coimbatore. We offer Encapsulated Screw Compressor to our clients. 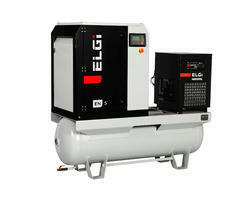 We are one of the prevailing organizations for providing EN Screw Air Compressor in the market. These compressors are developed using advanced technology and quality component which further increase the strength and durability. These machines are commonly used to supply compressed air to various industrial applications. Besides, our clients can receive these compressors at market affordable price. 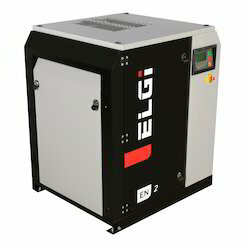 Elgi’s EN Series Screw Air Compressor are designed to encapsulate all functional components of the compressor within a common housing. With a small footprint, high reliability and low maintenance requirements, these compressors are ideal for industrial applications where size, efficiency and cost matter. We offer our client an excellent quality range of EN Series Screw Compressor which are available in oil injected and oil-free versions. The basic principle is the same (the rotors ‘push’ the air to one side), but they are quite a different machine. Screw compressors provide whisper quiet and efficient operation that yields up to 35% energy savings. These products are available with low maintenance single stage or two-stage friends. Standard low-sound enclosures keep noise levels to a minimum.